Powers/Abilities: Val shoots super-heated "steam plasma." She is angry and rebellious, and often lashed out against both friend and foe when frustrated. When last seen, she was 16 years old, so her powers can be expected to grow with age. (Freex#5 (fb) - BTS) - Val was one of a number of infants in a hospital injected by the woman known as Wetware Mary with nanotechnology derived from the Fire People, intended to create a race of super warriors. 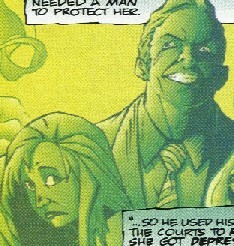 (Freex#7 (fb)) - Val's mother was a successful psychologist, but she was fragile, always needing a man to protect him. Her dad was a lawyer, who only cared about winning. When her parents split, her father tried to bribe Val and Ronald, Jr. into saying their mother was unfit so he could win custody of them--just to win it. The kids refused, so Ronald, Sr. used his pull in courts to ruin their mother. Marie became depressed and spent all of her time looking for a man to save her. Val took care of herself, but she was also forced to raise her brother herself; she resented this, seeing it as an unfit "reward" for being loyal to her mother. Marie married Dr. Arthur Geisler, a rich, respected community hero. He had the control that Marie needed, but young Ronald, Jr. rebelled against his step-father, who threatened to break the young boy. Marie wouldn't go against Arthur, so Val called the police. However, Marie used her psychologist training to talk the police out of getting involved, effectively claiming that Val was crazy and allowing Arthur to continue beating young Ronald. Arthur eventually had Ronald sent away to a special school for "behavior problems," but was actually involved in some sort of research, Val heard this and told her mom, who refused to believe her, of course. Soon Val was the one that Arthur had to "break." She tried to run away, but was caught by a cop who was friends with her father, and returned home. 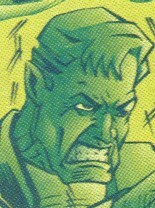 However, as her father continued to abuse her, Val eventually lashed out, releasing her powers for the first time. His suspicions that Val was not normal confirmed, Arthur pressured Val to keep her powers secret and sent her to a girl's school. Even here, Val was not happy, as the teachers didn't like the angry look in her eye, and tried to break her spirit. Eventually, the pressure inside Val became too much for her, and she punched a locker in frustration, releasing steam and fire that set the school on fire. Val fled the school and started a life on the streets, moving from city to city to avoid others who could bring her back to her step-father. Still, Val continued to encounter men who offered to "help" her, as well as muggers in the homeless shelters. Val tried to keep her powers in, but she often ended up starting fires and getting arrested. (Freex#1(fb)) - In solitary confinement, Val was confronted by a prison guard who tried to force himself on her. Val fought back, and her powers exploded, killing the guard, and presumably allowing her to escape. (Ultraverse Presents#0/6) - Val slept overnight in a laundromat, but when the owner returned, he, too, tried to force himself on her. Val nearly fried him, but a pair of Ultras, Ray (Boom Boy) and Lewis (Anything)--sent there by a third ultra, Michael (Plug), who was gathering together teens with similar origins--stopped the man peacefully and then helped Val escape as the cops arrived. Val distrusted the Ray and Lewis, but after they revealed their similarities and offered her sanctuary, she agreed to go with them. (Freex#1) - Lewis, Ray, and Valerie fought off some cops while stealing some supplies. They found Angela (Sweetface) outside of their room, and then Ray gave them their codenames and named their group: the Freex (his spelling). They were then confronted by Michael, who had been the one to summon them all together. (Freex#2) - Valerie initially attacked Michael, blowing his computerized form to pieces, and she blasted Ray with pressurized steam to the face when he tried stop her from hurting anyone else. While the others struggled with the cops, Val was picked up (literally) and by another Ultra, Rush, who took her far from the fight. Val forced Rush to let her go, but Rush convinced her that she would be better off with her. Rush took Val with her on one of his missions as an enforcer for loan sharks, to demolish the labs of Biotex. (Freex#3) - Val accompanied Rush as he began to sabotage Biotex, and when they argued, she got mad and began destroying stuff, too, causing an explosion that stunned them both, As they left, they were confronted by the Master of the Hunt and his Bloodhounds, employed by Biotex to clean up the mess. They were joined by the other Freex and escaped. Val initially fought with Rush against the Freex, but she soon saw that he regarded all of them as birth-defects and as freaks (unlike himself, who had had himself mutated in a lab at his own choice), and she decided to stay with the Freex instead. (Freex#4) - When Ray compared Valerie to Miss Sophia from his favorite book (Adventures of Tom Sawyer), she burnt the book, his only treasured possession in the world. The Master of the Hunt and his Bloodhounds found and attacked the Freex again. They escaped (though Michael was taken prisoner), and Val left the others briefly, stealing another copy of Tom Sawyer for Ray. The Freex were then taken in by the modern day hippie Ruby, but the Master tracked down the Freex and shot Ruby. (Freex#5) - The Freex managed to fight off the Master and his Bloodhounds, freeing Michael in the process. Val's powers badly burnt the Master, and his own Bloodhounds turned on him. The Freex fled into the night. (Break-Thru#1) -The Entity from the Moon bombarded Earth with a variety of energies. Val's mind was dramatically affected, and she sought to travel to the moon, releasing a burst of energy that bowled over the others. 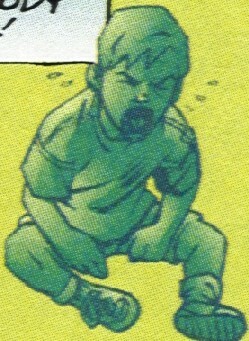 (Freex#6) - After another outburst, Val lapsed into s stuporous state. The other Freex were duped into an alliance with Mangle, who led them to assault J. D. Hunt's estate and take down Hunt's robot guards in an effort to gain access to Hunt's son, Guy, until he was stopped by the Night Man. The Freex mistakenly fought the Night Man, and then fled again with Mangle, continuing the pursuit of Guy. Val was of some help in the struggle, though she blasted the hero Night Man, who sought to save them from Mangle's manipulations. (Night Man#3) - Val remained dazed from the energies being released by the Entity from the Moon, but was still convinced to followed Mangle's lead in pursuit of JD Hunt. Upon finding Hunt, they were attacked by his NuWare Wolves. Night Man arrived and fought the Freex loyal to Mangle and stopped the villain from assaulting Guy Hunt. 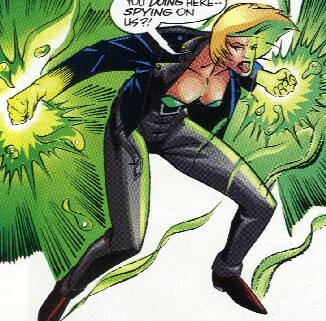 (Freex#7) - Lewis led the Freex to steal some clothes, which led to more in-fighting, including Valerie again blasting Ray. Despite this, Ray later approached Val and listened to her frustrations and the two made their peace. They were then attacked by the Night Patrol, and both taken out by them, but the other Freex drove them off. Val disagreed with Lewis and joined the others in following Michael's plan to learn the truth about their powers. (Freex#8) - Val and the rest of the Freex managed to save Lewis from the Lost Angel, after which they were confronted by the Old Man. (Freex#9) - The Old Man easily defeated the Freex, dodging a blast from Val that instead hit Lewis, and told them that they needed a leader to train them. He then led them to escape another attack by the Night Patrol. Val was very impressed by the Old Man and voted that they stay with him, but she was overruled when the others agreed to keep searching for their origins on their own. After the Old Man was gone, they realized that Ray was missing (abducted by Contrary and taken aboard her ship). (Freex#10, 11) - The Freex managed to track Ray to Mt. Shasta. The whole group was captured by Contrary and her Academy for the New Elite (Val was drop-kicked by Flygirl) who sought to force them all to join her. The Freex broke free, but as they battled Contary's young wards in the Academy, Ray announced that he had decided to stay with Contrary to gain an education. Cayman, one of the Academy, decided to join the Freex. 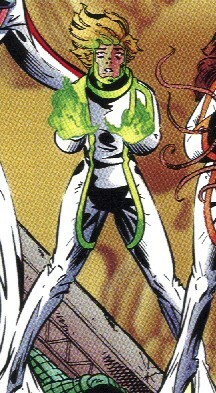 (Freex#14) - Contrary helped the Freex defeat the Night Patrol, and then Ray rejoined the Freex. They went back down to the realm of the Fire People, where they found the Savior breaking out of his containment. Ray forced the door to the Savior shut again, and he then elected to stay behind to hold the door in case the Savior threatened to break out again. Val told Ray how she wished she could be as brave as he. (Freex#15) - Arriving in San Francisco back on the surface, the Freex and the Old Man joined forces with Firearm in an effort to stop Rafferty, the killer of Ultras. The Freex fought the Night Patrol again, but Michael was killed by an arrow to the chest from Rafferty. (Freex#16) - The Freex attended the funeral for Michael, along with the Academy members, Contrary, the Night Man, and Ruby. After the Freex had fended off another assault by the Lost Angel, the Old Man goaded the Freex into a fight. They defeated him, proving that they were now ready to stand on their own. They decided to head back down the tunnels and visit Ray, but on the way, they were pulled through a time warp. (Freex#17) - The Freex arrived in ancient Egypt, where they encountered an early group of Someday Champions (recipients of the nanotech/wetware power created by Prometheus) as well as Rune (in the guise of the Priest of Amon-Ra). Val enjoyed the royal treatment, such as the luxury of bathmaids. After over a month there, Val explained to Lewis that Angela might be pregnant. The Freex helped drive off Rune when he attacked Analla (one of the Someday Champions). (Godwheel#0, 1, , 3) - Val, along with Cayman, Feline, and Flygirl where teleported to Vahdala by the god Argus, who sought their help in recovery the three items of the Crucible of Life. Argus had also summoned Boneyard, Hardcase, Lord Pumpkin, Lukasz, Mantra (actually possessed by Necromantra), a Prime skin husk (which Necromantra transformed into Prime-Evil), Warstrike. As Argus tried to force them all to obey him, Val lashed out at him to know avail, and was swatted into unconsciousness. While Necromantra, Lord Pumpkin, and Prime-Evil agreed to serve Argus (for their own agenda), the others broke free and fled. The still-dazed Val was lagging behind, and she was subdued by Rune, who sought vengeance on Argus. Rune impersonated Val and replaced her with the others on their quest to gain the items of the Crucible to prevent Argus on the others from getting them. When the heroes returned to Vahdala, Val found them and revealed Rune's duplicity. Val joined with the others in opposing Argus (merged with Lord Pumpkin), Rune, and Necromantra, but the tide was ultimately turned when Argus attempted to summon aid from Earth-616's Loki (or another like-minded Asgardian), but instead brought Thor. The thunder god created an interdimensional portal through which they banished the Crystal Crown--one of the Crucible's components--and Argus went after it. Thor teleported the heroes back to their Earth while he returned to his Asgard. (Freex#18) - Val and Cayman returned to Earth, as Contrary tried to forge an alliance with the Freex, but AJ recognized that she had ulterior motives and resisted her. Contrary incapacitated the Freex with a disruptor weapon that affected their helmets, and she then took AJ away to her citadel for further care. Val and the rest of the Freex (including Val and Cayman) found themselves trapped in the realm of the Fire People, and they heard the Savior stirring in his containment chamber.